Coconut cakes are notorious for unhealthy ingredients – Ina Garten’s recipe calls for 1 1/4 pounds butter, 1 pound of cream cheese and 1 pound of confectioner sugar – yikes! So I spent a long time researching lower fat, healthier options. I came across a gluten-free, dairy-free cake from Nourishing Days, that used coconut flour and oil instead of all-purpose flour and butter. Oranges are in season – one of the few fruits that are at this time of the year, so I thought, why not, I’ll give it a try! I doubled the recipe to fit the size of a bundt pan. I also subbed out coconut oil for olive oil because I thought that would pair really nicely with the orange juice, and seamed “healthier” to me. Taking a quick glance at the doubled recipe, I noticed that the cake now called for a dozen eggs! I’m trying to avoid overindulgence here, so I needed to be creative to cut that down. I thought maybe if I separated the eggs, and beat the egg whites to add more volume, it would make up for cutting out half the eggs. 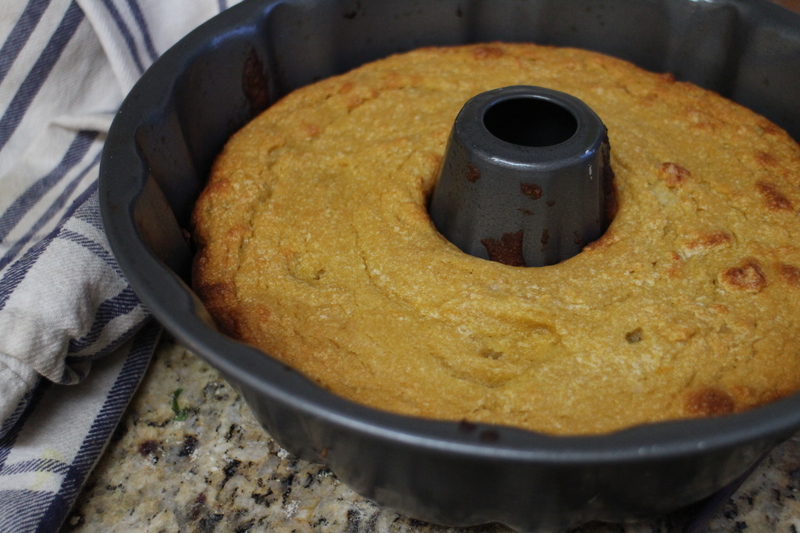 I also added a bit more baking soda to help the cake rise, and the modifications seemed to do the trick! I generally find gluten-free, dairy-free desserts to be pretty lifeless, but this cake is really moist, super light (thanks to the beaten egg whites) and incredibly delicious! I brought the cake into work the next day and got so many compliments on how delicious it was. Everyone was surprised and impressed that it was gluten-free! While I’m not sure this would take home first prize at the county fair, especially when compared to a cake like Ina’s, it certainly satisfies the sweets craving with less than half the fat, and definitely a fraction of the guilt. Note: This cake stuck to the pan for me, so underneath all that delicious whipped coconut cream is a big gaping hole from where it stuck. That’s the beauty of the cream, it covers up any imperfections without anyone knowing! If you don’t want to make a bundt cake, simply 1/2 the recipe and use an 8×8″ square pan, or 9×5″ loaf pan. Regular whipped cream can be substituted for the coconut whipped cream if you prefer. Preheat the oven to 350° F. Heavily grease a 9-cup bundt pan with olive oil or non-stick spray (this cake can be sticky) and set aside. 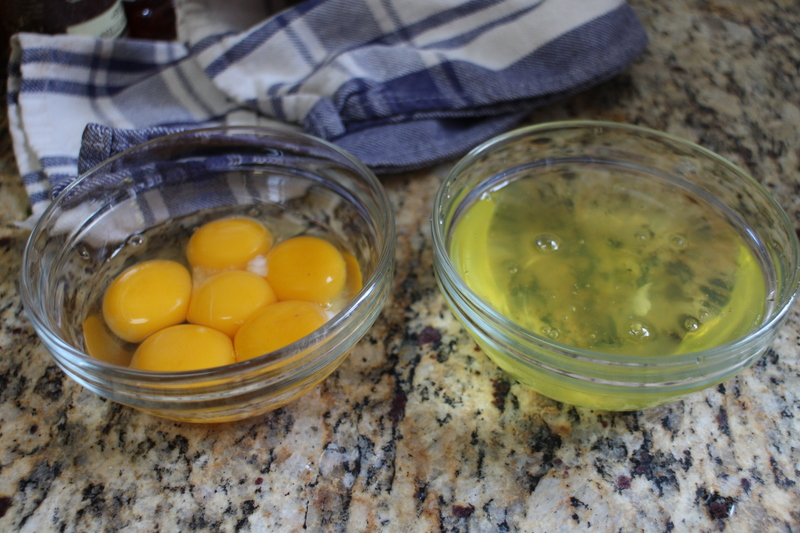 In the bowl of a stand mixer, beat the egg whites on medium-high speed until soft peaks form. Set aside. 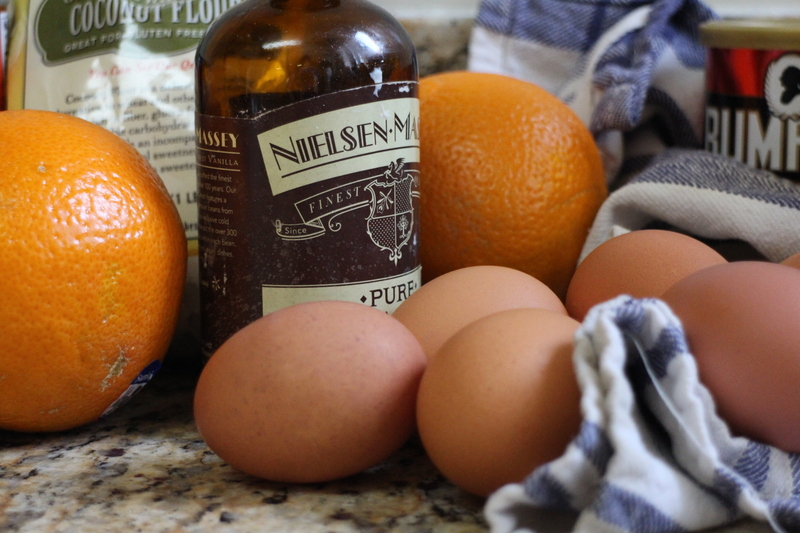 In a large bowl, whisk together the egg yolks, olive oil, coconut milk, honey, and juice and zest of 1 orange. In a separate bowl, mix together the coconut flour, baking powder and salt. 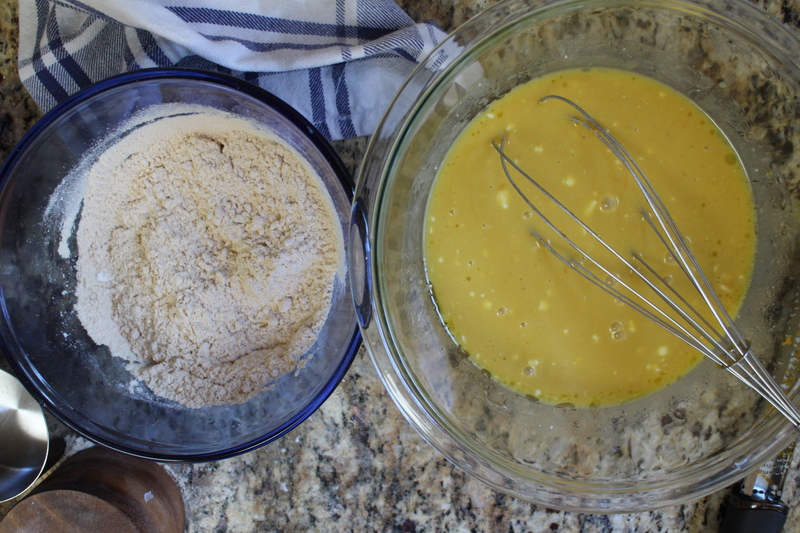 Slowly add the dry ingredients into the egg yolk mixture, and whisk until evenly mixed. Gently fold in the egg whites until just incorporated, do not over-mix. Pour the batter into the prepared bundt pan. Bake for 35-4o minutes, until cake is golden brown and a toothpick inserted into the center comes out clean. Remove the cake from oven and place on cooling rack. While the cake is still in the pan, poke holes in the bottom of the cake and pour juice of the remaining 1/2 orange over the cake. Allow to cool completely before removing from pan. Place the can of coconut milk upside down in the freezer for at least an hour (or in the refrigerator over night). Turn the can right side up, open, and pour the coconut water into another container (the water should be relatively clear), reserving the creamy, white coconut cream. Scoop the thick coconut cream out into the bowl of a stand up mixer. Beat on high speed until soft peaks form. 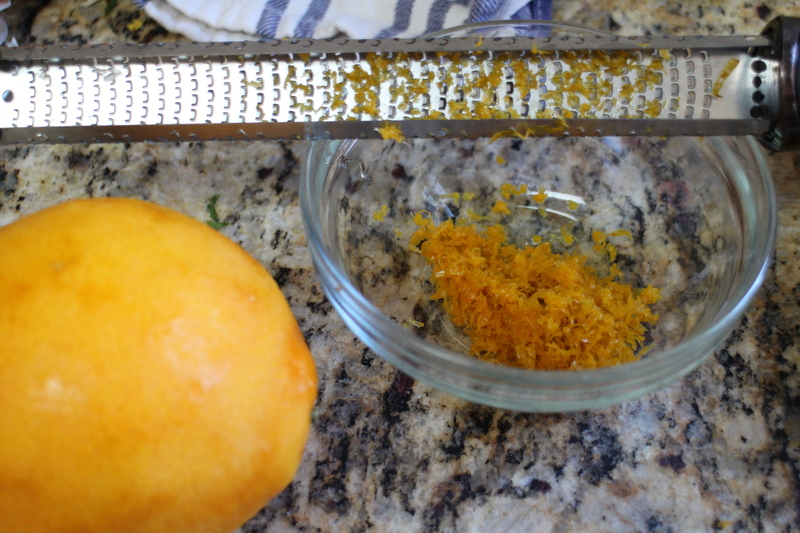 Add the honey and orange zest and beat until combined. Generously pour the whipped cream over the bundt cake and spread to smooth. Drizzle about a tablespoon of honey decoratively over the cake before you serve. Cake will keep for 2 days, wrapped tightly in plastic wrap and refrigerated. Oh how great it is when the whipped cream can cover up any flaws or gaps from the cake sticking to the pan. Nice way to bring in citrus in the winter with this cake. Thanks Renee! Yes coconut whipped cream was definitely a life saver! Even if it doesn’t look pretty it still tastes delicious! So that’s the trick with whipping up the coconut milk! I tried it last year and it failed miserably. Thanks for sharing. I did a lot of research about the coconut whipped cream, and a lot of people had trouble with it, but I think the key is to make sure not to shake it so that the cream and water are separate before putting it into the fridge. Chilling it makes it easier to scoop out the cream. It was so delicious, I think maybe even better than whipped cream! I tried and successfully made an apple and caramel bundt cake – thanks for sharing your recipe. I’ll try your version soon. Yum! I think apple and caramel are one of the best flavor combos out there. Thank you for visiting! I didn’t know it’s possible to whip the coconut milk, very clever! I like the combination with oranges! Hi Jelena! I loved the coconut whipped cream, I think it might be even better than the original! Your cake looks beautiful and sounds delicious! I never experiment with gluten free recipes because I’m terrified that they’ll come out dense and rubbery- but it looks like yours worked out perfectly! I’ll have to give it a shot sometime! Thanks Tux! I was hesitant about the gluten-free for the same reason, but it turned out really well and nobody knew that it was gluten-free! I’ll be back to wheat flour and butter soon though 🙂 Can’t stay away. Im right there with you, but i do have several friends with varying degrees of gluten intolerance, so its nice to know i have good options if i need to make something they could eat! Great minds think alike for this month’s theme, I’ve also made a gluten free cake and topped mine with coconut whipped cream. Coconut and orange sound like a lovely combination, I shall have to try it sometime. Yum! Isn’t coconut whipped cream the best! I never knew it existed before, and I’m so glad I know about it now! What a fantastic bundt cake!! It looks SO moist and tender! I wanted to see how you have used orange with Coconut. It looks delicious. Whipped Cream, has just made it extra delicious. I think citrus and coconut just go together so naturally and I love that you used coconut milk for the whipped cream. A great option for a gluten-free cake. But I ca not find coconut flour in my city. It looks so delicious!!! Hi Parricia – you can find coconut flour online if your local grocer doesn’t have it (amazon usually sells it). You can probably also sub in all purpose flour and add in some shredded coconut – it’s always fun to experiment! Cassie, try using parchment paper so that the cake comes out easier. Also you can spray the paper with olive oil if the first suggestion doesn’t work. This cake looks wonderful and I will definitely try it. Thank you for the advice! I will definitely have to try that next time! I love that you made it healthier! It is gorgeous! 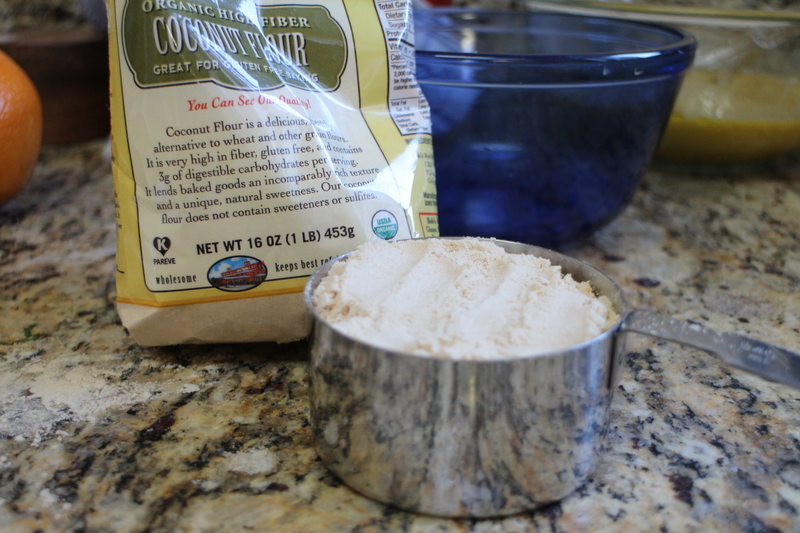 If you can’t find coconut flour in the store, you can buy it online (amazon usually has it), or a quick google search will show you how to make it! You can probably also sub in all-purpose flour and maybe add in some shredded coconut – although I haven’t tried this so can’t comment on how it turns out – but I’m sure it would be delicious! Hello Cassie, your blog is Beautiful and your recipes *sigh* – the BEST. Thank you for checking out and following my blog, I’m inspired by your wonderful content. Thank you so much! I’m so happy to have found your blog as well! What wonderful recipes! I love my bundt pan! You’ve inspired me to use it this weekend.